Theorie en praktijk voor het manoeuvreren met zeeschepen en andere grote vaartuigen. Engelstalige editie van het boek Manoeuvreren met zeeschepen. English edition of the book Manoeuvreren met zeeschepen. Manoeuvring is a matter of experience: through a lot of practice – sometimes very complex -manoeuvres will be carried out more and more smoothly. Nevertheless, the many actions that have to be taken must be based on theoretical knowledge. This knowledge of kinetics, hydrodynamics and regulations is essential for every seafarer that ever has to manoeuvre a ship. 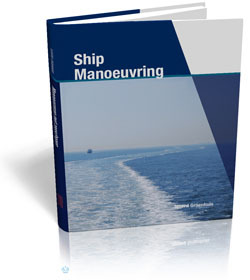 ‘Ship Manoeuvring’ provides the theoretical information, but has managed to link it to day-to-day practice. Matters like anchoring, tug assistance or passing other ships are addressed extensively. Also, subjects like preparing for passage or navigating through traffic separation schemes are dealt with, in clear understandable terms; the text contains many illustrations and is peppered with technical jargon. Author Sjoerd Groenhuis, who is a seafarer himself as well as a former teacher at the Shipping and Transport College (STC), has written this book in accordance with the most recent STCW guidelines. The book contains an ‘operational’ section and a ‘management’ section, making it suitable for educational purposes but also for professional use. Engelstalige editie van het boek Manoeuvreren met zeeschepen. Voor een Nederlandse beschrijving kijkt u bij de Nederlandse editie.